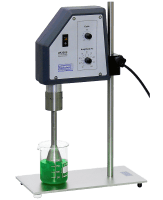 The ultrasonic lab devices UP200H (200W, 24kHz) and UP200S (200W, 24kHz) are well suited for all general ultrasonic applications in small and medium scale. The applications include: Homogenization, disintegration, emulsification, cell disruption, degassing or sonochemistry. 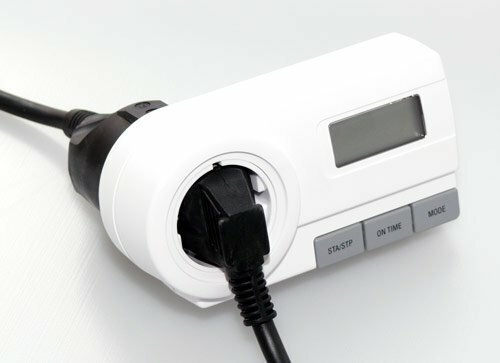 The production of these models of the 200W ultrasonicators has been discontinued and is replaced by the digital models UP200Ht and UP200St. Please visit the page of the UP200Ht and UP200St for the most current information. Of course, we still supply sonotrodes, accessories and services for all models! 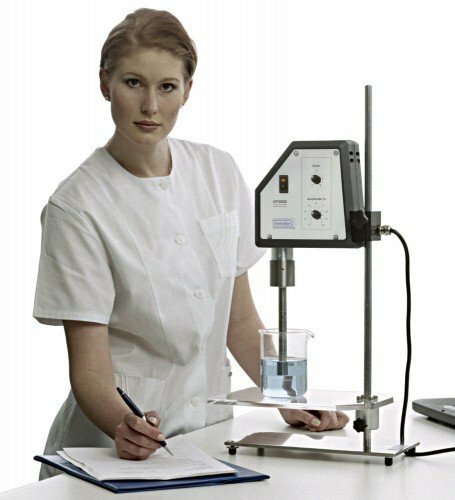 Handheld or stand-mounted homogenizer? If your answer to this question is “I want both!”, the UP200H (left picture below) is the device of choice. If you need a stand-mounted homogenizer only or if you typically run you trials in the sound protection box, the UP200S (right picture below) is the more reasonable device. 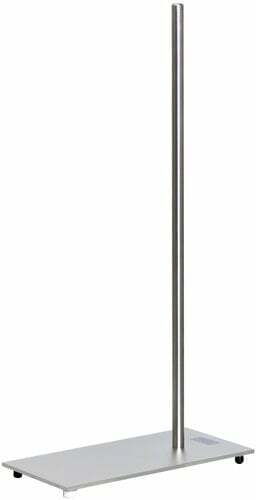 The ultrasonic processor UP200H (200 watts, 24kHz) is the most powerful handheld device, but it can be mounted to a stand, too. The exceptionally progressive design was rewarded with well known “International Designer Award” by the iF (Industry Forum Design Hannover). Since then this device is the flagship of our compact laboratory devices. The ultrasonic processor UP200S (200 watts, 24kHz) differs from the UP200H only in its shape and can be used at a stand or in the sound protection box, only. 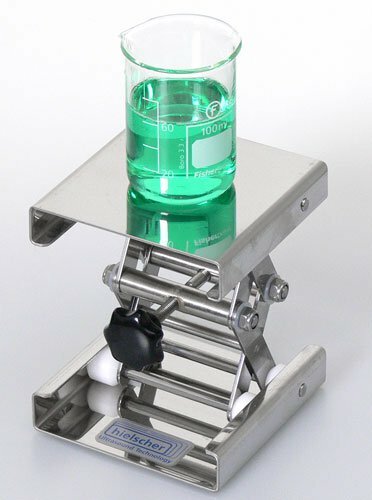 It is the first choice for your laboratory, when no handheld operation is needed. The performance and parameters are identical to that to the UP200H. 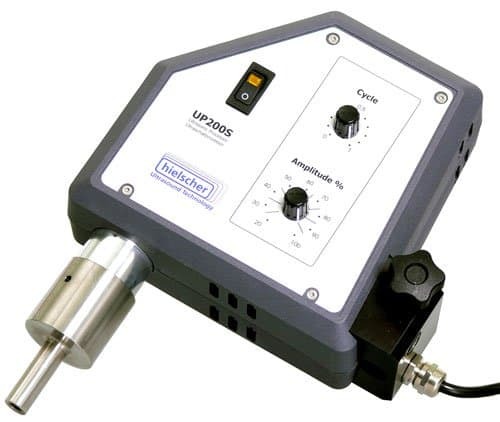 Both ultrasonic devices – the UP200H and UP200S – are very effective in the homogenizing, dispersing, emulsifying, extracting and degassing or in the disruption of cells . They can be used to enable, enhance or speed up chemical reactions (sonochemistry), too. 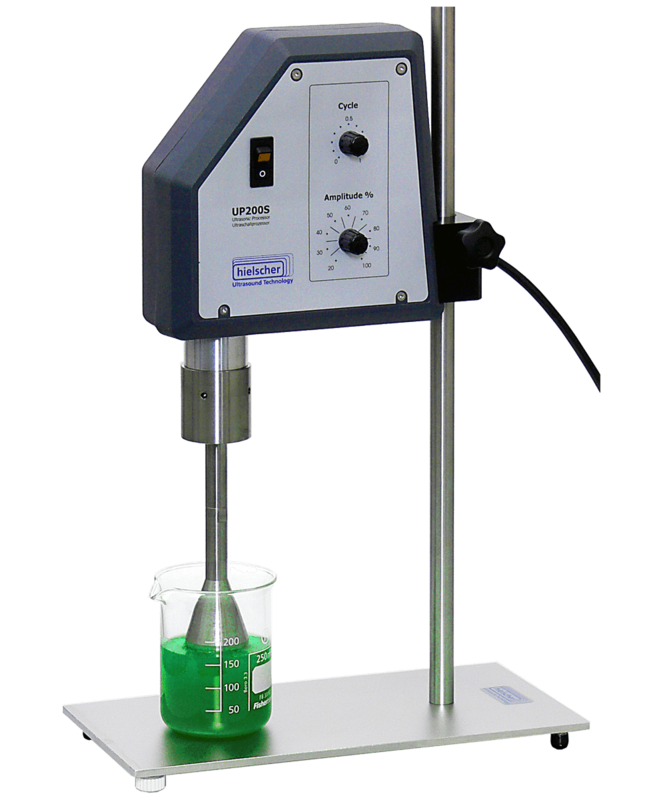 Generally, the UP200H and UP200S are used for the sonication of sample volumes from 0.1 to 2000mL. 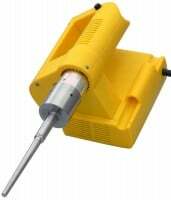 We offer sonotrodes from 1 to 40mm that can be used for either of the devices. 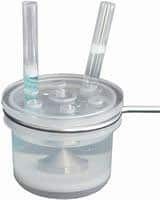 The 40mm sonotrode transmits the ultrasound smoothly across a relatively large surface and it is therefore suited to support degassing or cleaning processes. The smaller sonotrodes operate at higher amplitudes and at higher intensities, e.g. for harder applications. 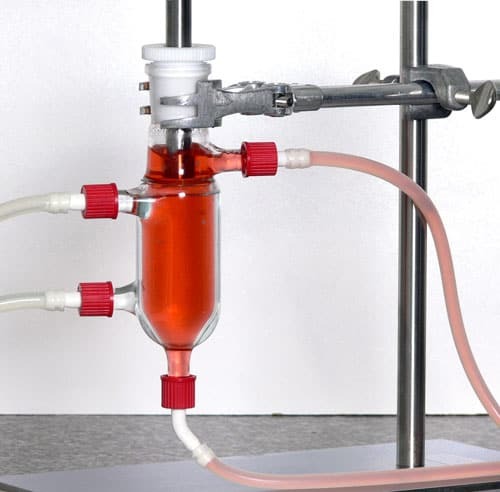 The UP200H and the UP200S are also used for the production of smaller quantities, mostly in continuous flow with the use of flow cells and the appropriate sonotrodes. 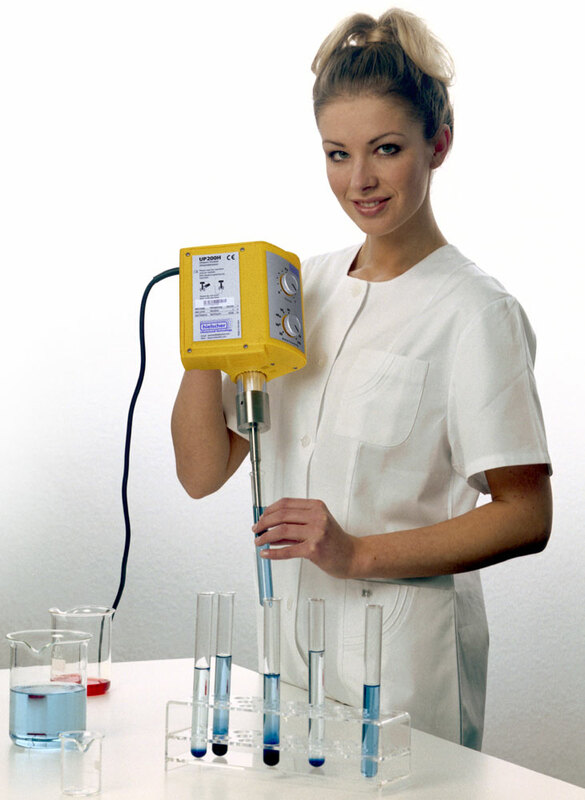 In combination with the flow cell D14K you can sonicate material in continuous flow, e.g. at 20 to 200mL per minute. By this, you can simulate continuous sonication processes in smallest scale. Both devices can be operated 24 hours per day (24h/7d), allowing for the processing of up to 180L per day (depending on the application). Like the other laboratory devices, such as the UP50H and the UP100H, the UP200H and the UP200S can be used for the indirect sonication of samples, too. For this the sonotrode is immersed into a sonication beaker, e.g. 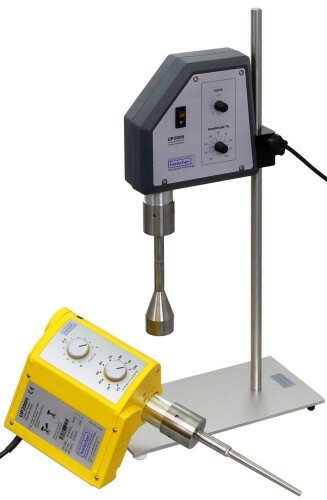 BB1-16 (right picture), transmits the oscillations in distilled water, that are reflected by means of a titanium cone and then transmitted into the test tubes with the sample. A comprehensive range of accessories is available for the UP200H and UP200S. 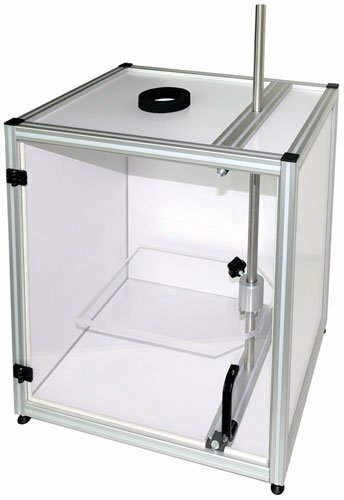 This includes flow cells, stand, sound protection box, timer and PC-interface. The PC-Interface facilitates the recording of trials for documentation or optimization purposes. 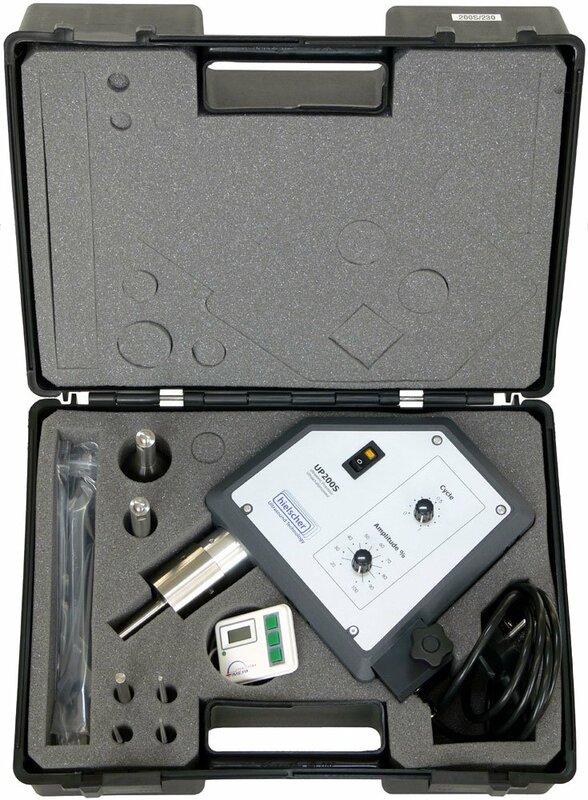 The ultrasonic device UP200S comes in a portable case.